At Clarion Productions, the goal is always to help you produce and record the sound you hear in your head and translate that to a high quality recording and at a reasonable price. Whether you need an engineer to simply press record or a producer/coach to help guide you through the process, you will ALWAYS be treated with a high level of professionalism and hospitality.. Together, we will create a great sounding recording. Clarion Productions is not your average home studio. With custom-designed acoustic treatment, the studio space offers an intimate and incredible sound for your recordings. Using professional grade equipment, we deliver recordings that sound as good as commercial studios' recordings. Clarion Productions has a partnership with Bop Stop Studios, where we track bands in another incredible sounding environment. This unique space can help take your recordings to the next level! Please use the contact form, or reach out to Bop Stop Studios directly to find out more about how this relationship can benefit your recordings. ​With a custom-designed acoustically treated control room, top quality monitoring and a wide array of professional plug-ins from iZotope, Soundtoys and more, Clarion Productions delivers mixes and masters of your songs that enable the listener to understand your artistic vision though the recording. Mix feedback is well-received and revisions are turned around quickly. 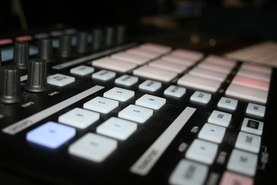 Clarion Productions also offers mixing and mastering services for your songs/projects that have already been recorded. Please contact us for rates for your project. ​Clarion Productions has a library full of hip-hop and R&B tracks that range from highly polished to fledgling loops awaiting your guidance and direction. Beats and productions in other styles are available by commission, but you can always come in and check out available beats, some of which can be heard here. Please visit the contact page here to inquire about rates for your project. Clarion Productions works with a wide range of immensely talented studio musicians, all of whom can be incorporated into your project. Top notch guitarists, pianists, keys players, bassists and drummers can be used for your session. Also, Clarion Productions specializes in adding horn sections to your song at any point in the recording or production process.